Here’s a quick sketch for this week’s word “Clique”. I’m playing around a bit with my dipping pen and ink again as I was inspired by the work at the Charles Schultz Museum by the master himself. I tried to draw kings and queens in their typical poses of “drama”. 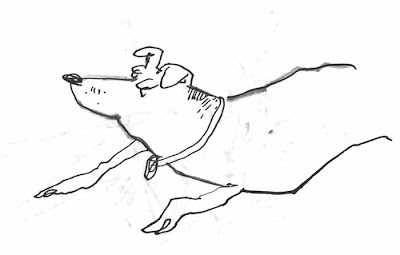 Drawing my dog Angel with the same pen and ink from above. I really liked the quality of the line, so I’m posting it. The lines really seem to speak to me, like a symphony of various sounds only it’s in lines. I’ve noticed that when I draw a quick line and I’m confident with the stroke, I get the best results. The clique of drama queens is great Vern but the dog is super! A great piece indeed, well done. Thanks for sharing the dip pen work; it’s really good. 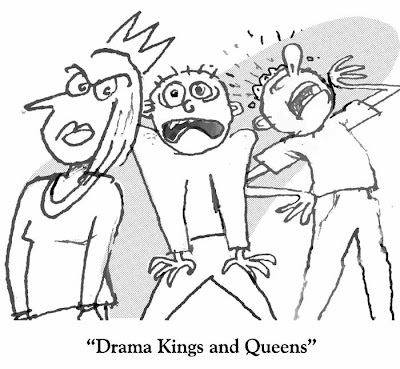 Your drama kings and queens are all too familiar. Love the dog. Now you’ve insprired me to take up my chop-stick again; it’s what I’ve enjoyed using with ink. Nice lines of using pen and ink, Vern. Although I haven’t tried using it before, the result comes out wonderful of your sketching! The expressions of your characters are really funny, too! I like experimenting with hand drawing too. Unfortunately when it comes to actually doing the work I always default to doing it digitally because that’s where I do most of my work, and so I’m most proficient that way. Still, it’s always nice to practice and experiment! Nice entry for this week!